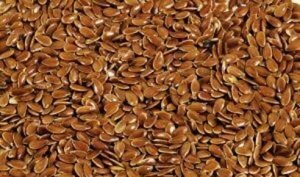 Flaxseed has some wonderful properties as well as tasting good when added to food. It has light nutty flavor which is sure to enhance any food that you make. You can simply add it to salads by sprinkling a few seeds over your usual green salad items. In a lot of respects you can use it where you would normally use sesame seeds. Flax isn’t just a seed for salads though. You can use ground flaxseed, otherwise known as flaxseed meal, rather like flour. You can also use flaxseed oil in the same way as you would use other oil including in salad dressings. The benefits of flaxseed are great in number. For a start of there are lots of good nutrients in each little seed. These include a wide spectrum of vitamins and minerals and lots of really good Omega 3 fats. In fact they have so much Omega 3 that they rival fish as a source of these valuable fats. This is good news if you are a vegan! More good news for vegans is that you can make a very good egg substitute using the gel found in flaxseeds. This gel is also found in the ground meal. It is very easy to use flaxseed meal as an egg substitute. You should also use it if you have an egg allergy. Another neat thing about flaxseeds is that they contain practically zero amounts of carbohydrate. This is because the stored energy of the seed is in the form of oil. As a result they are great when it comes to producing food to fit in with a low carb diet. You can use flaxseed meal in the same way that you use flour. This means that it is great for baking. Exchanging part of the flour for flaxseed meal when baking will add valuable nutrients to your food such as fiber and omega 3 fats. If you use flaxseed meal instead of wheat flour you can also make baked goods that are gluten free. This is then great for people who have a gluten allergy or celiac disease.